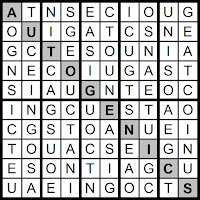 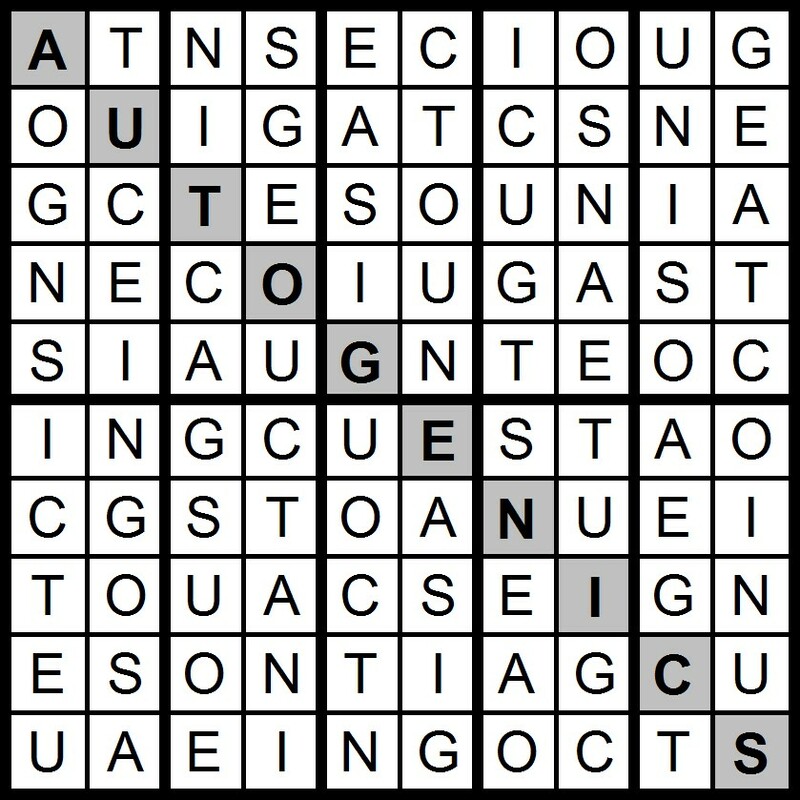 Yesterday's 10x10 AEIOU Hidden Word Sudoku puzzle was based on the letters AEIOU +CGNST (AUTOGENICS). 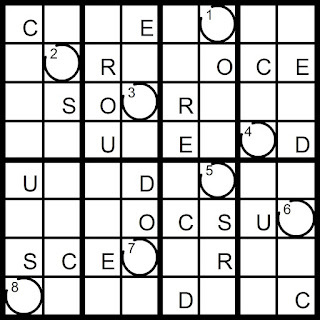 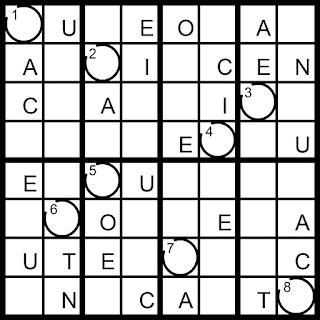 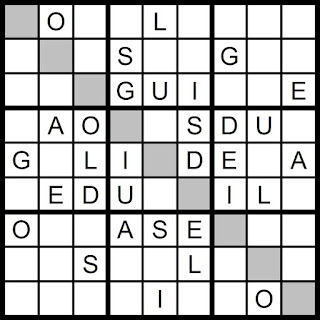 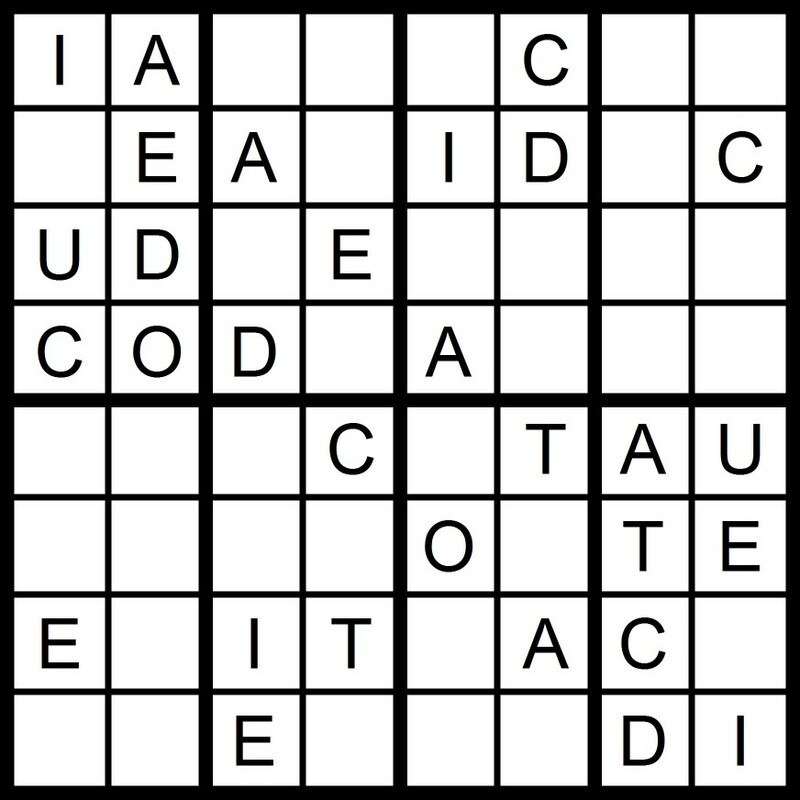 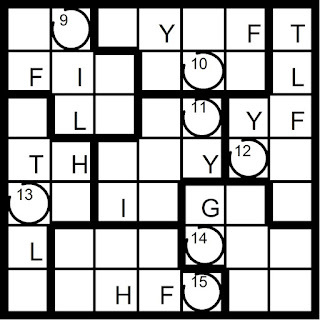 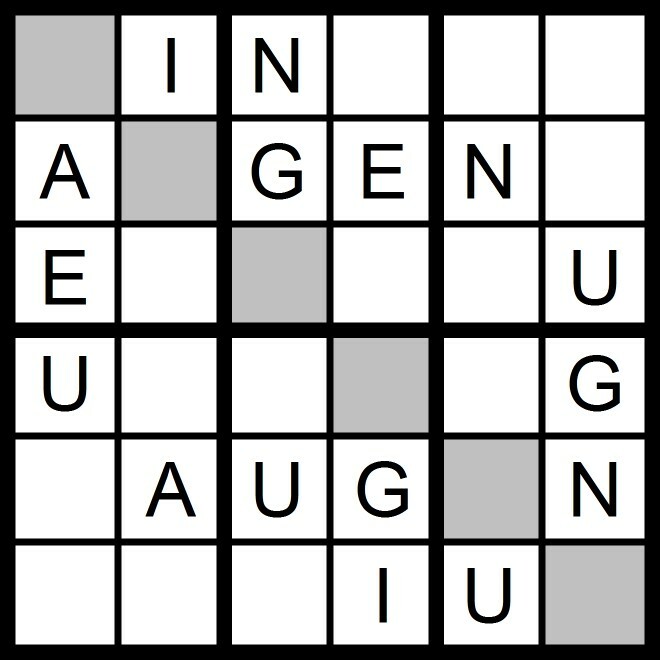 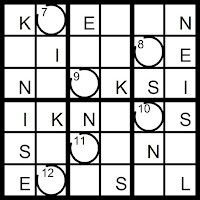 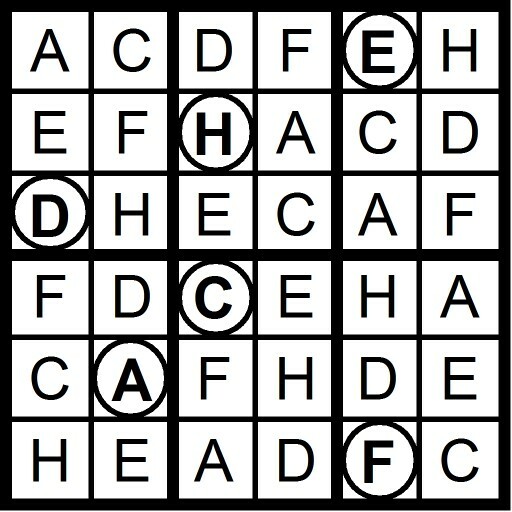 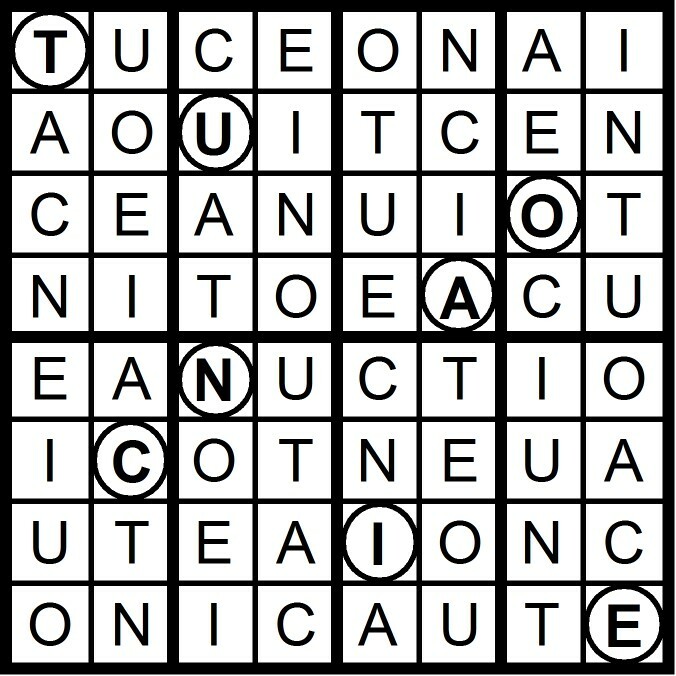 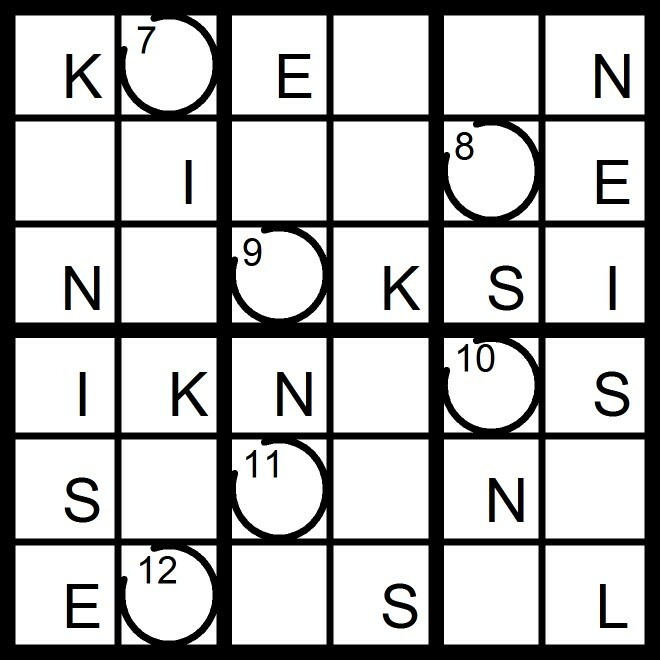 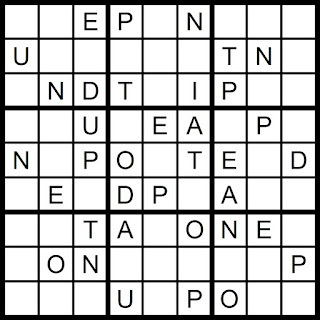 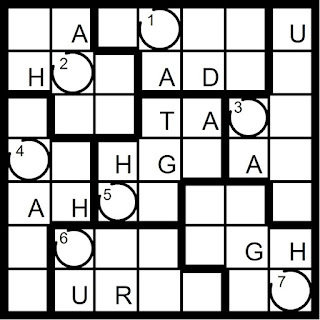 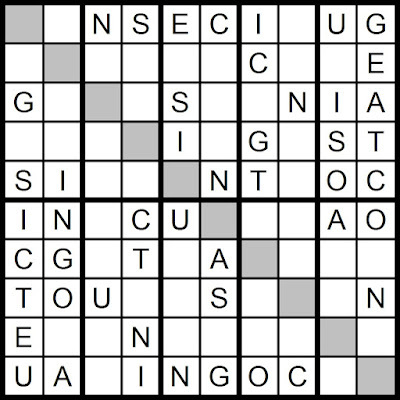 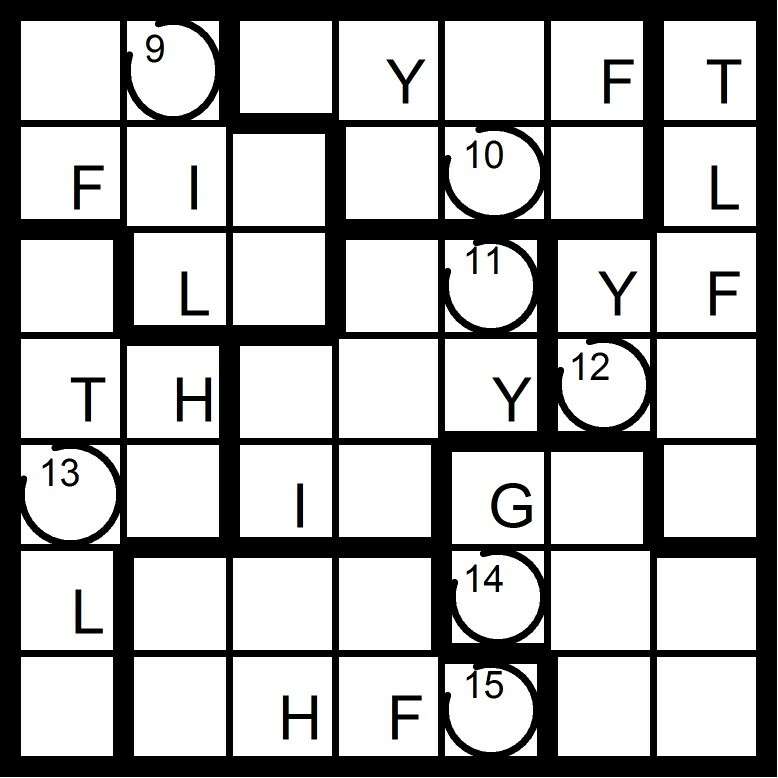 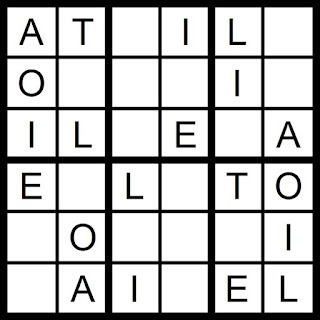 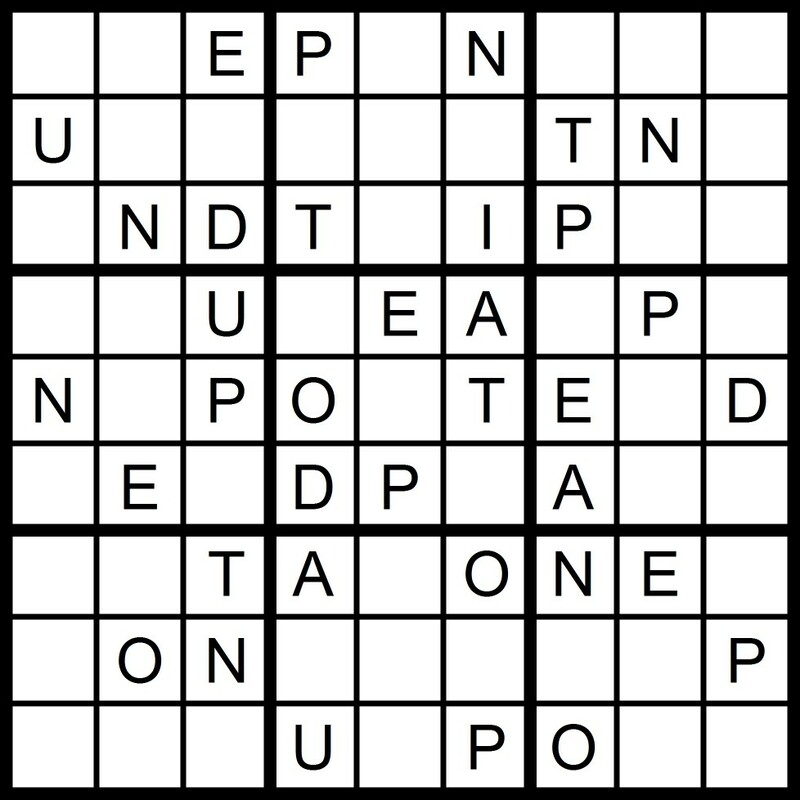 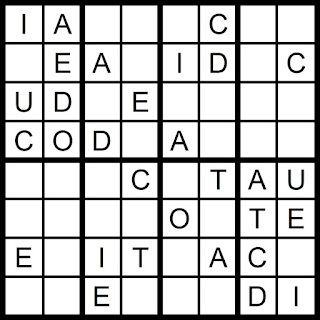 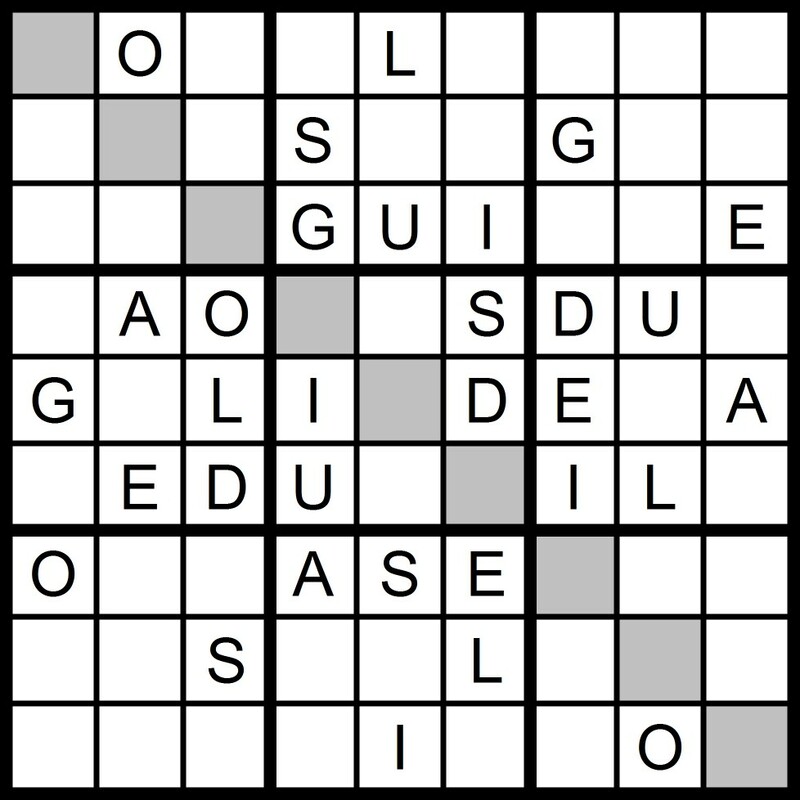 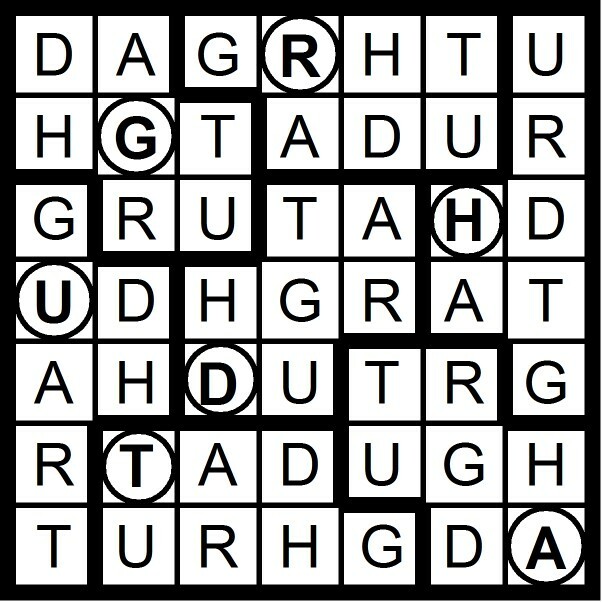 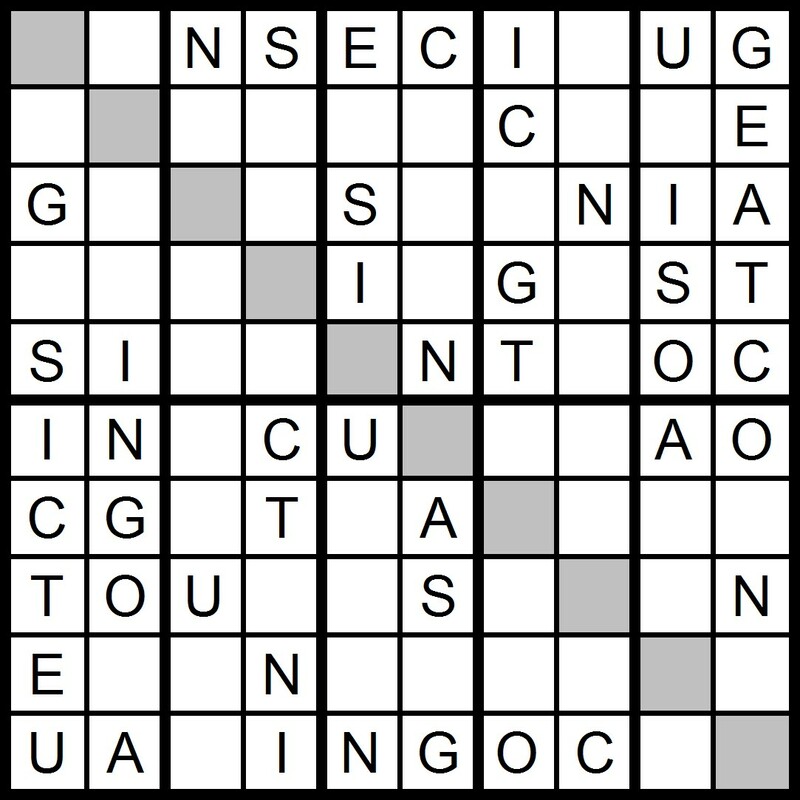 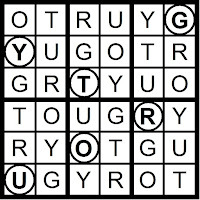 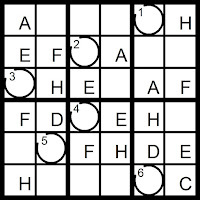 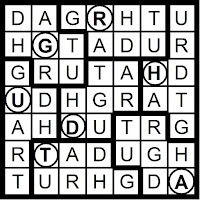 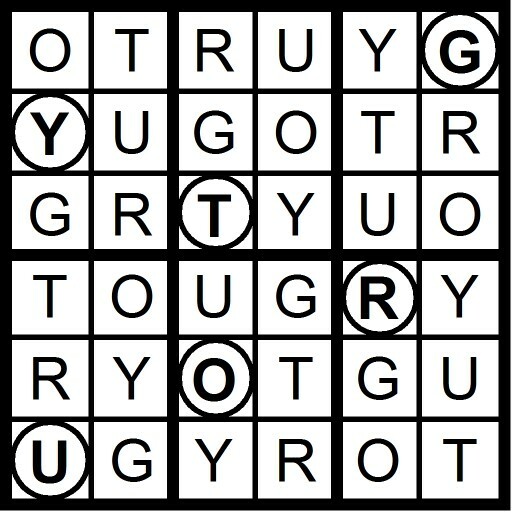 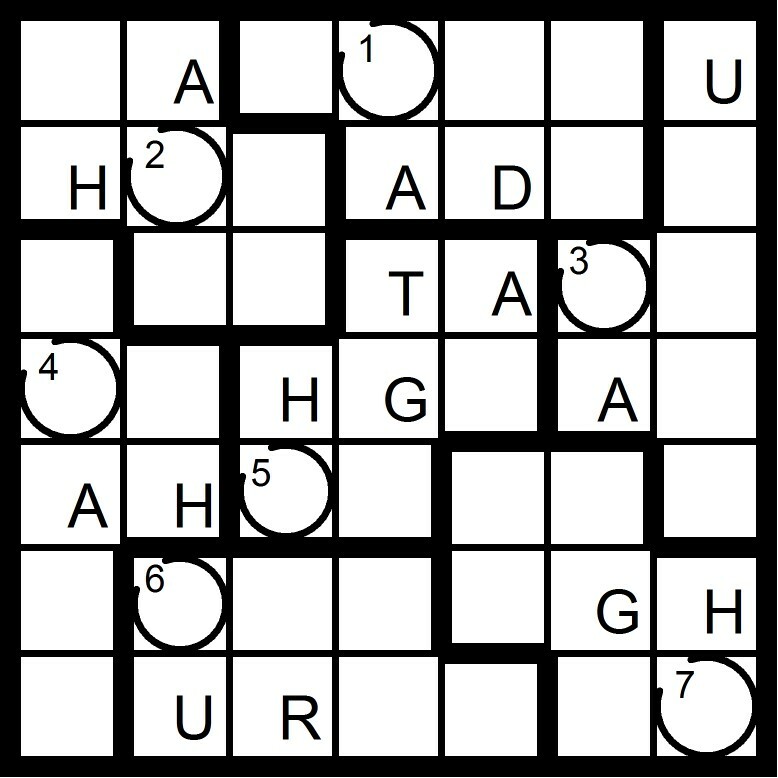 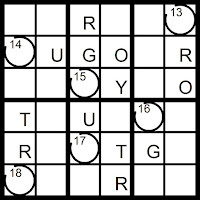 Today's 10x10 AEIOU Hidden Word Sudoku puzzle contains the letters AEIOU +CGNST. 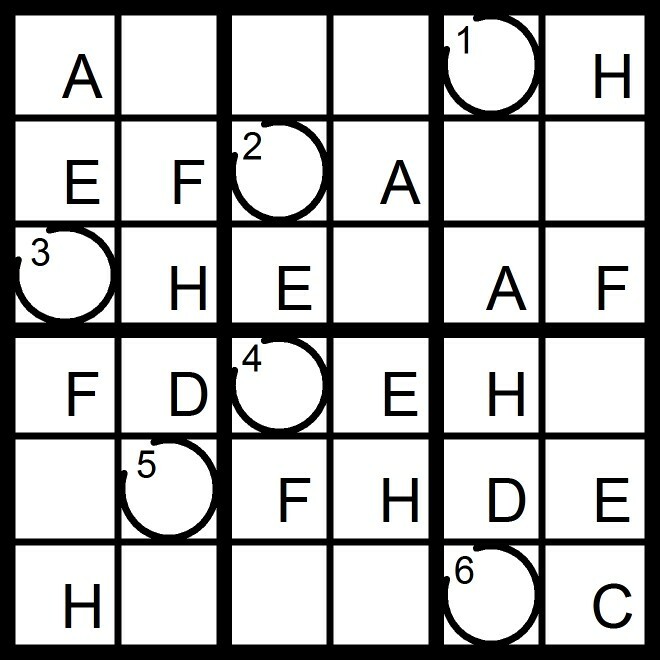 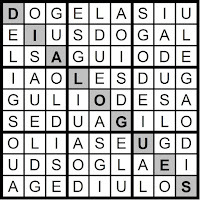 Yesterday's 9x9 AEIOU Hidden Word Sudoku puzzle was based on the letters AEIOU +DGLS (DIALOGUES). 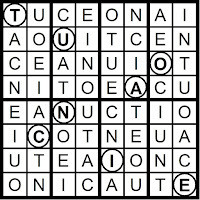 Yesterday's 8x8 AEIOU Word Sudoku puzzle spelled out three different words using only the letters AEIOU +CNT (CONTINUANCE, ENUNCIATION, ACCENTUATION, INCUNEATION and CONTINUANCE IN ACTION). 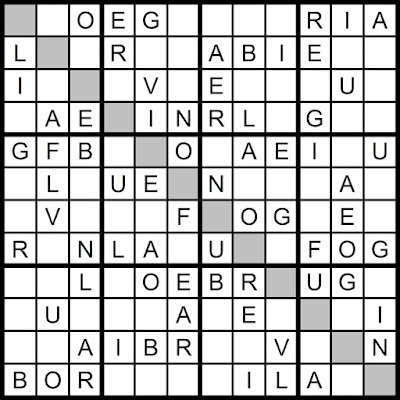 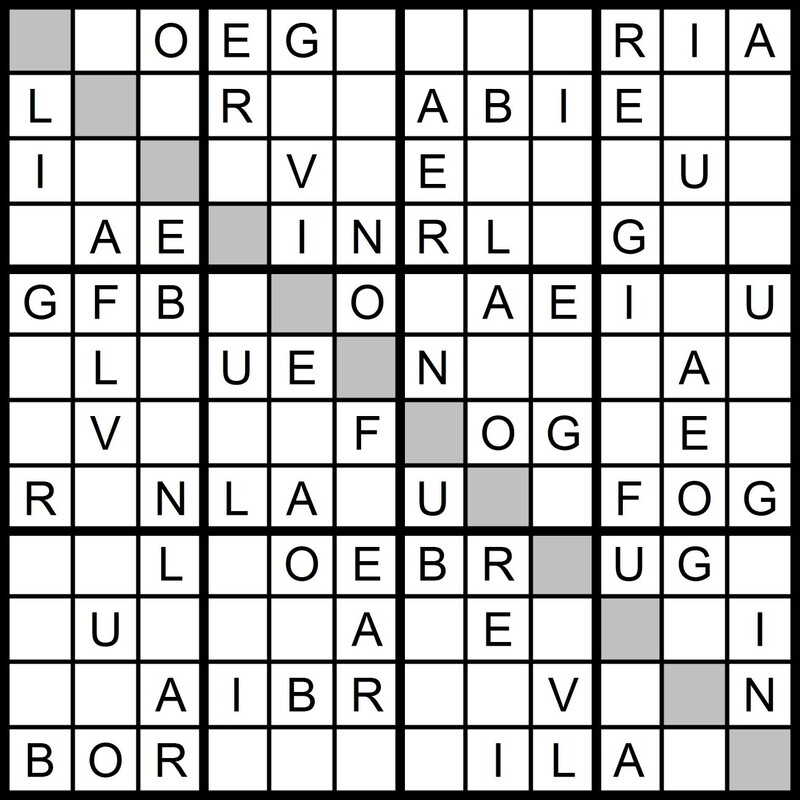 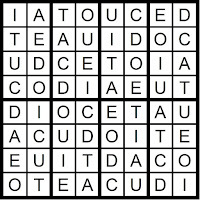 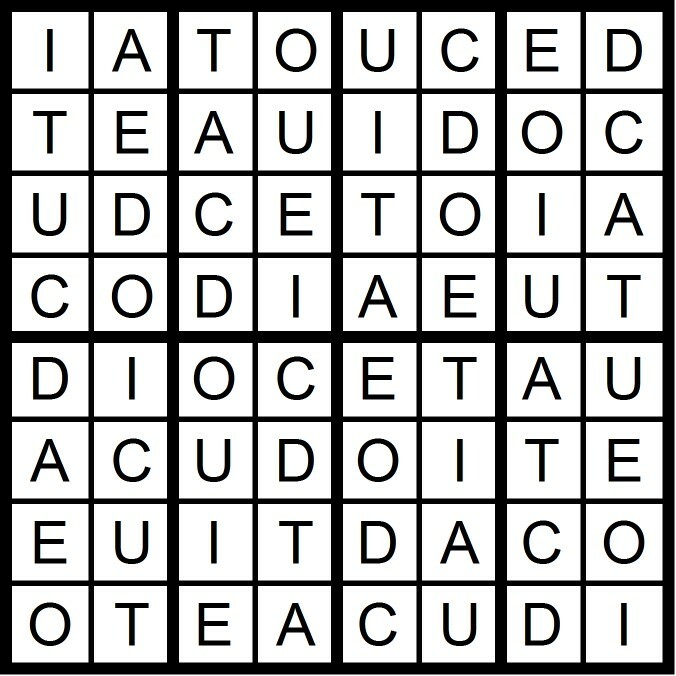 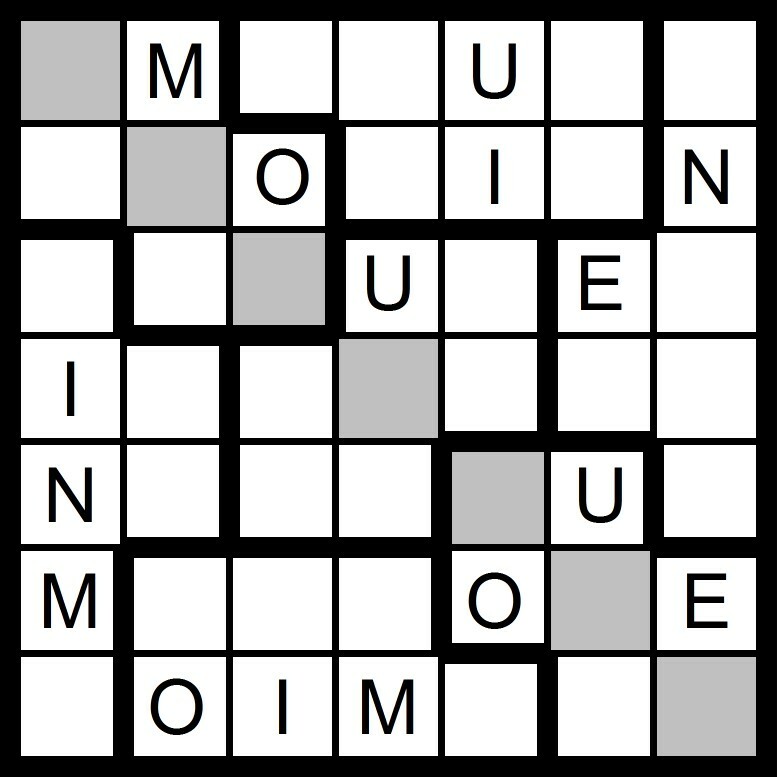 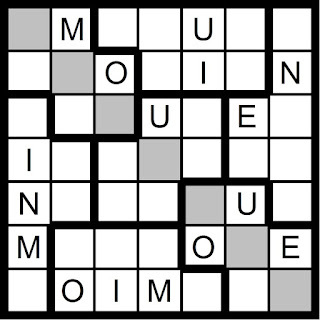 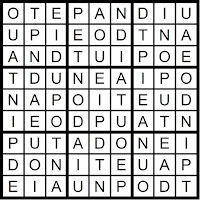 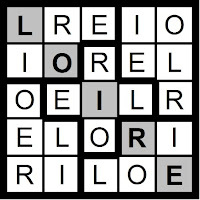 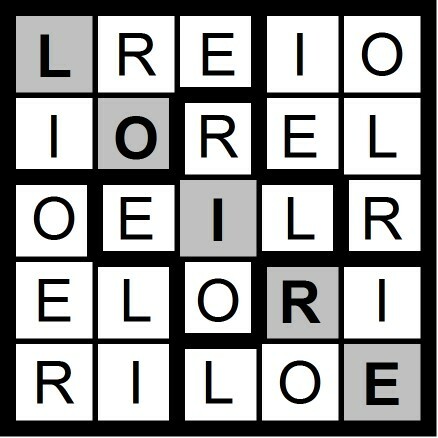 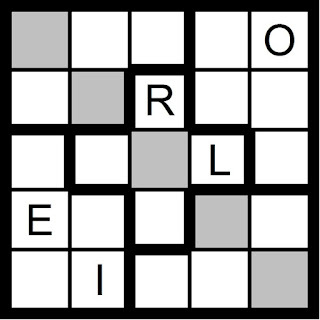 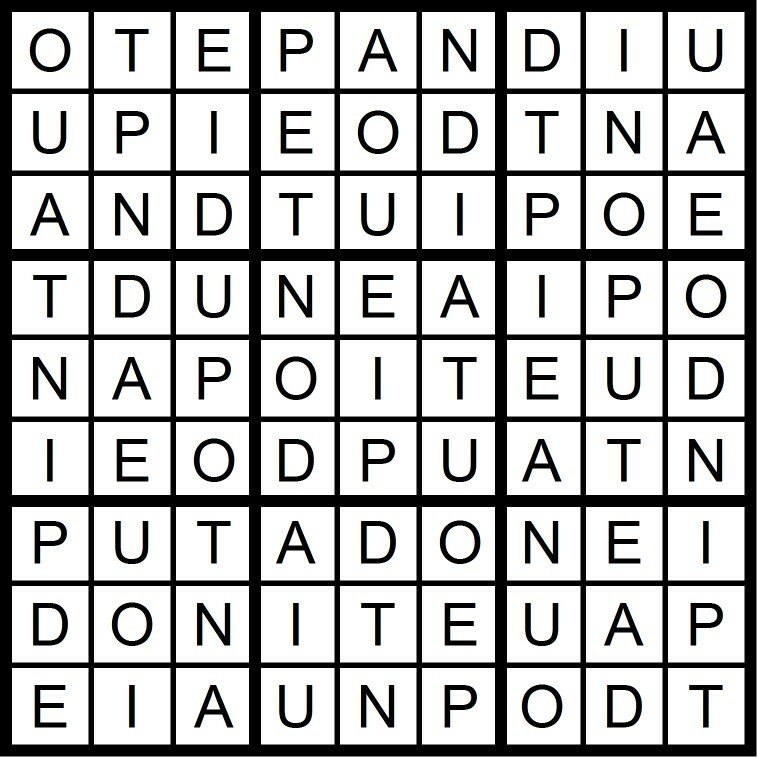 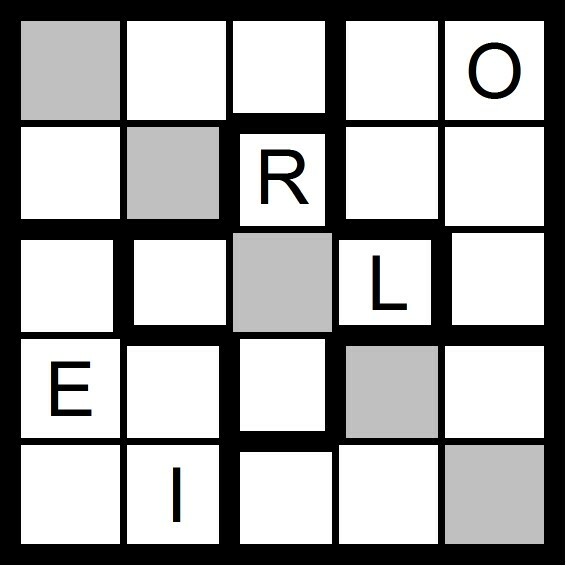 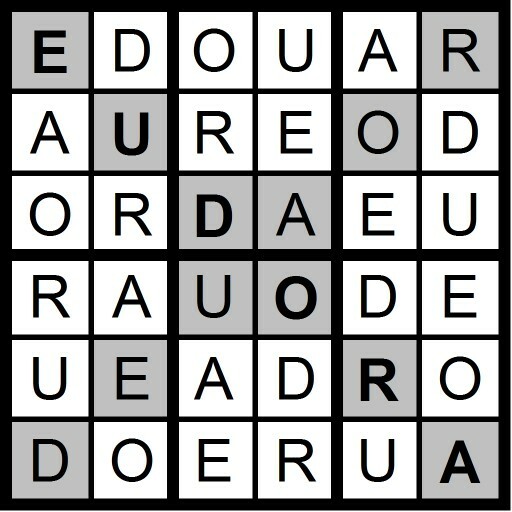 Yesterday's 5x5 Hidden Word Sudoku puzzle was based on the letters AEIOU -AU +LR (LOIRE). 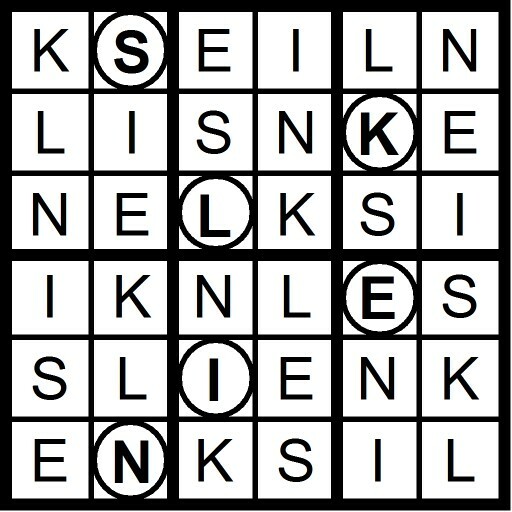 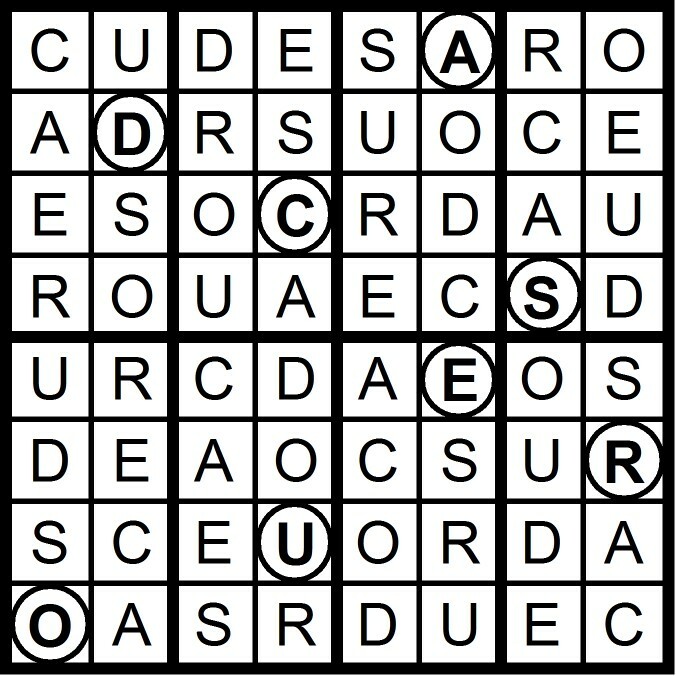 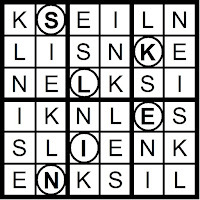 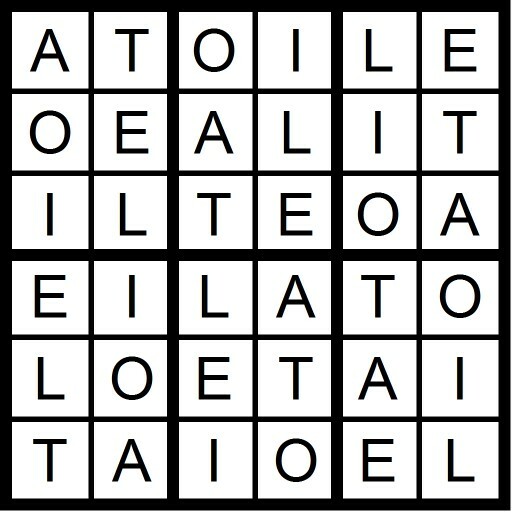 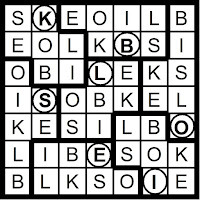 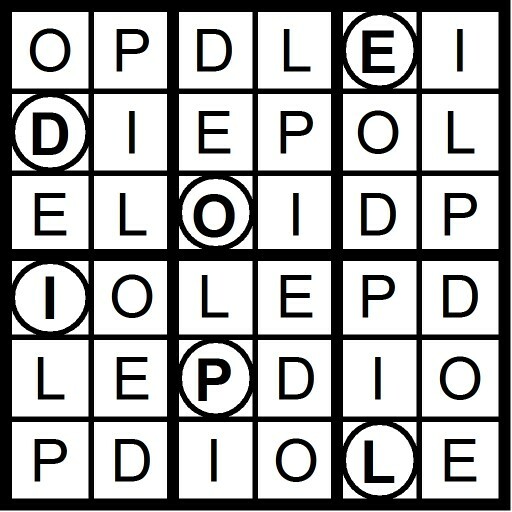 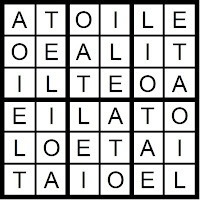 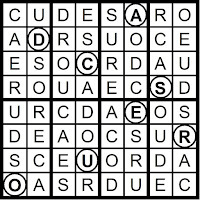 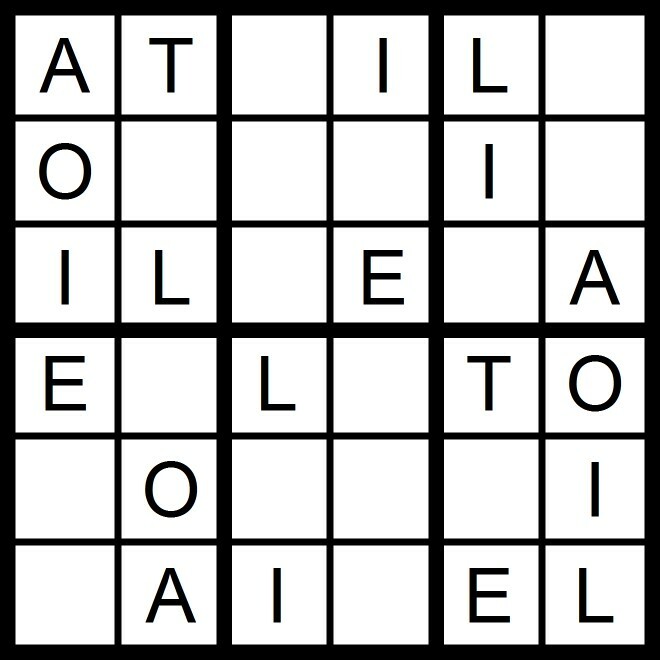 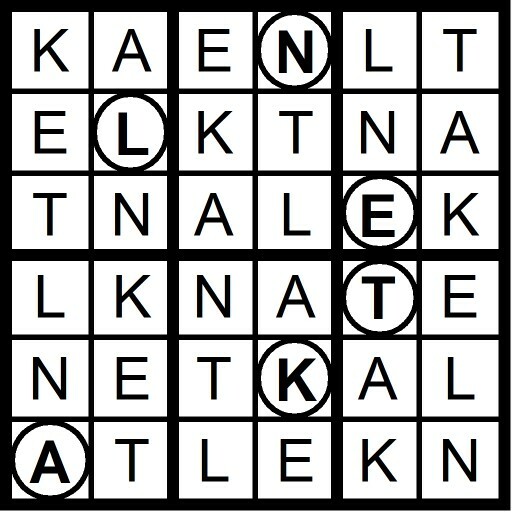 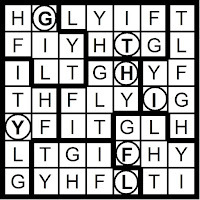 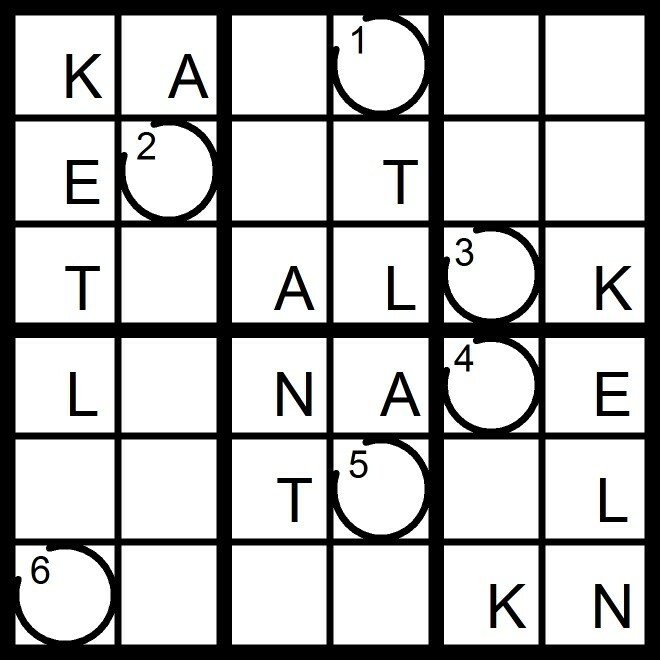 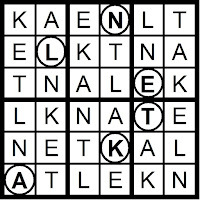 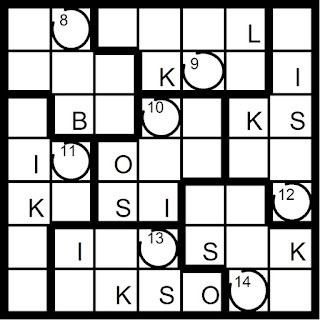 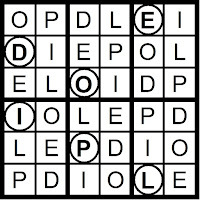 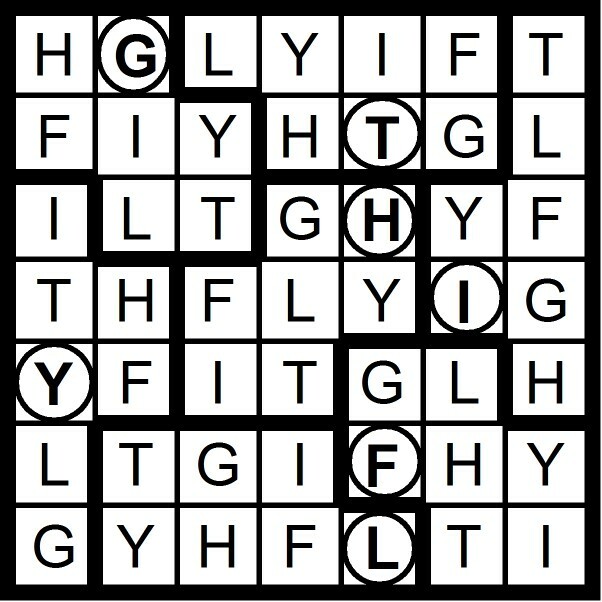 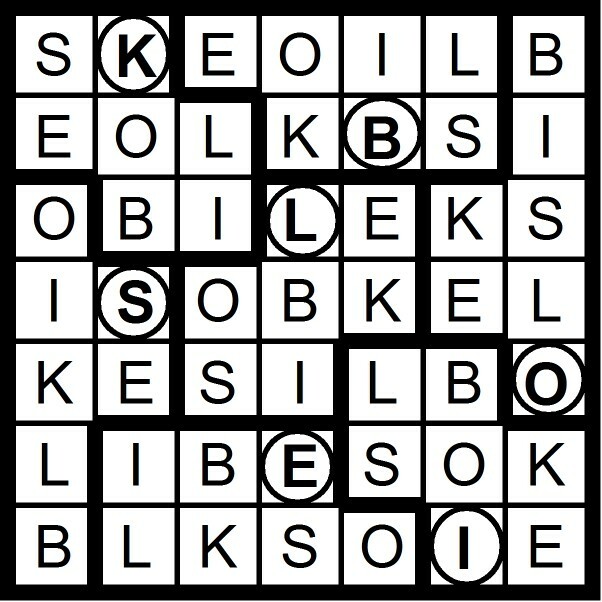 Today's 5x5 Hidden Word Sudoku puzzle contains the letters AEIOU -AU +LR. 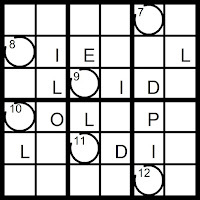 Yesterday's 6x6 Word Sudoku puzzle was based on the words TEA OIL. 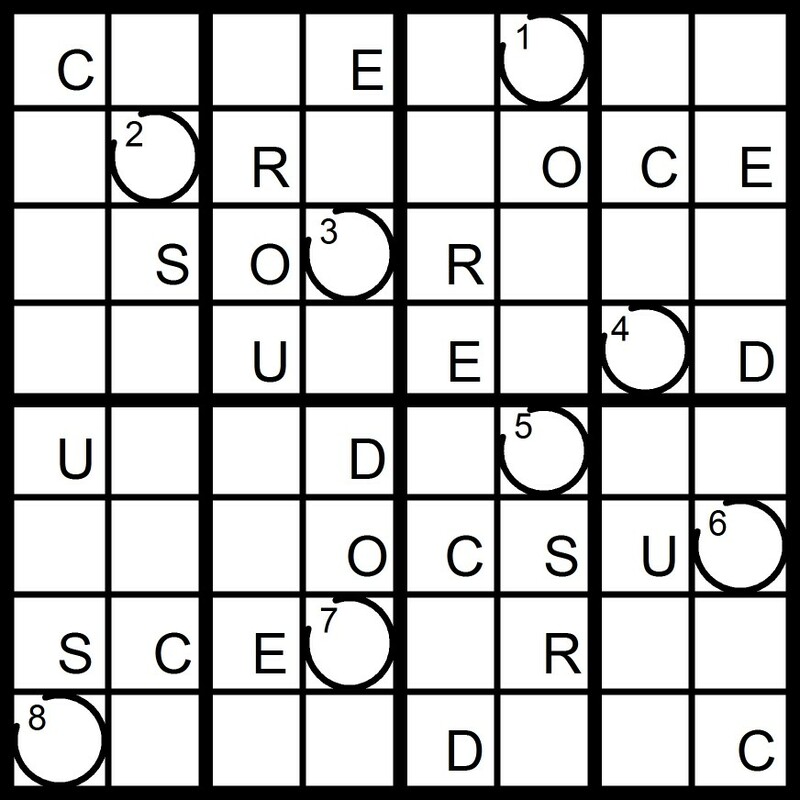 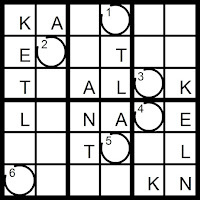 Today's 6x6 Word Sudoku puzzle is based on the words TEA OIL. 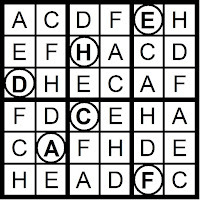 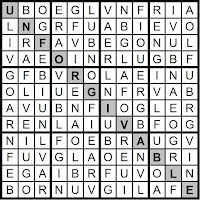 Yesterday’s Sunday Challenge AEIOU 12x12 Hidden Word Sudoku puzzle was based on the letters in the anagram FAVORING BLUE (UNFORGIVABLE). 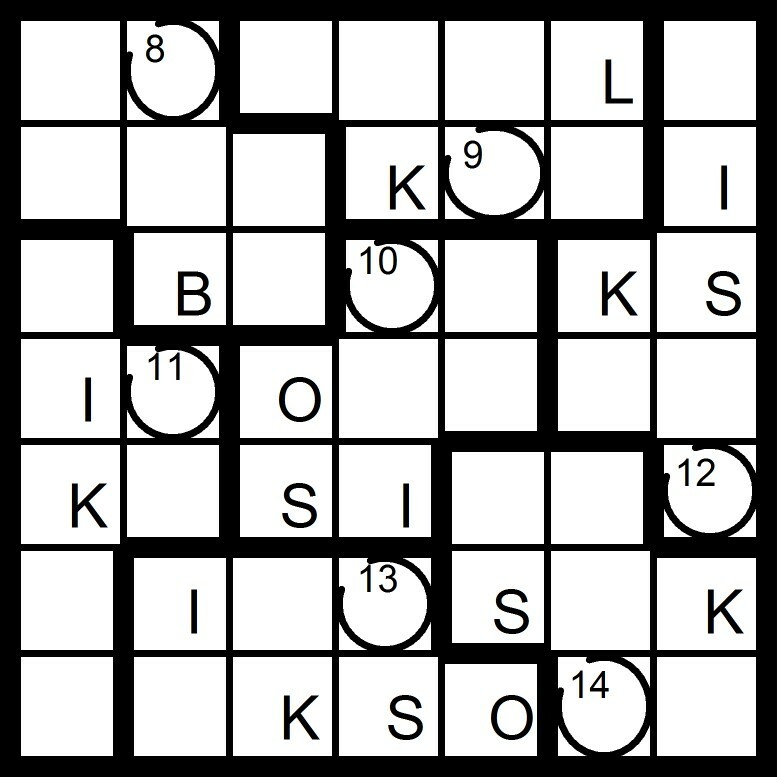 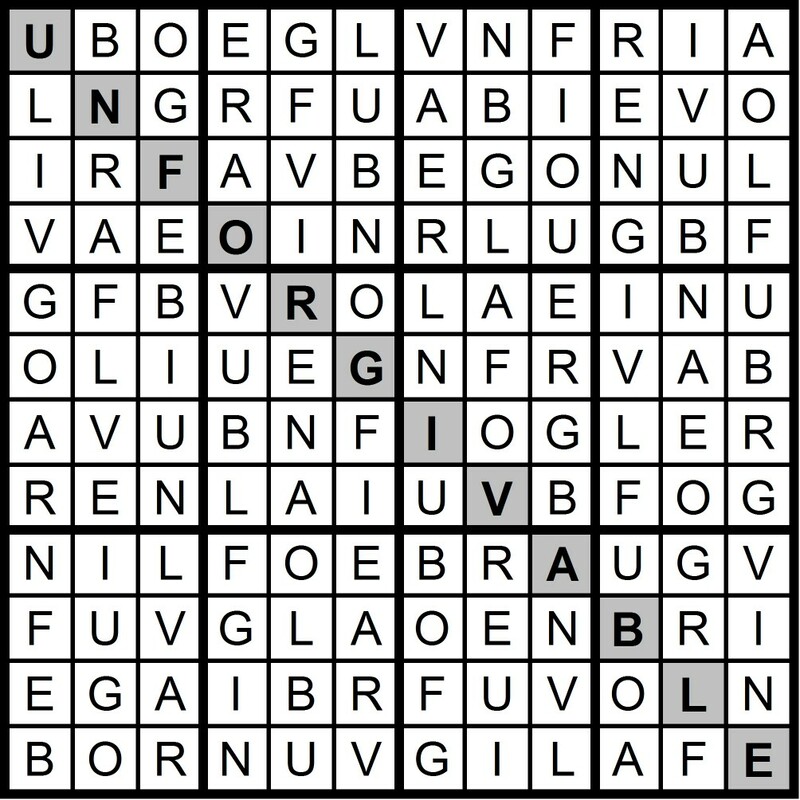 Today’s 12x12 Hidden Word Sudoku puzzle contains the letters in the anagram FAVORING BLUE. 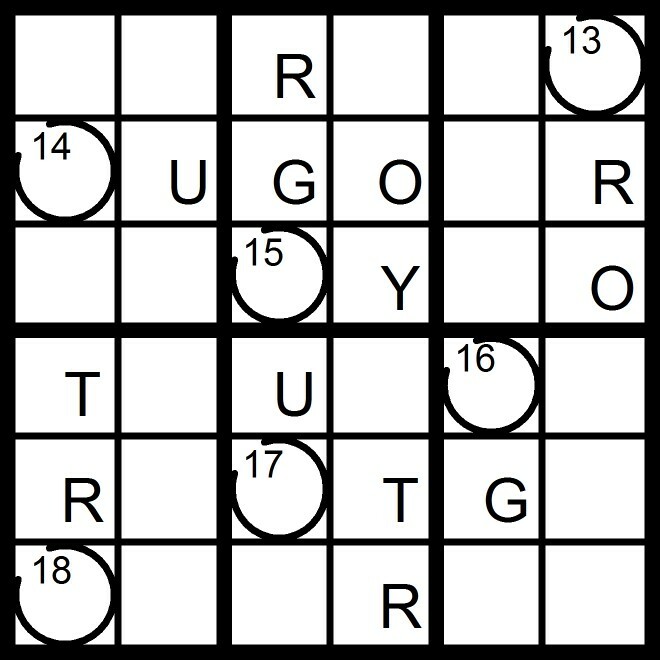 Yesterday's 10x10 AEIOU Diagonal Word Sudoku puzzle was based on the letters AEIOU +BMNRT (TAMBOURINE). 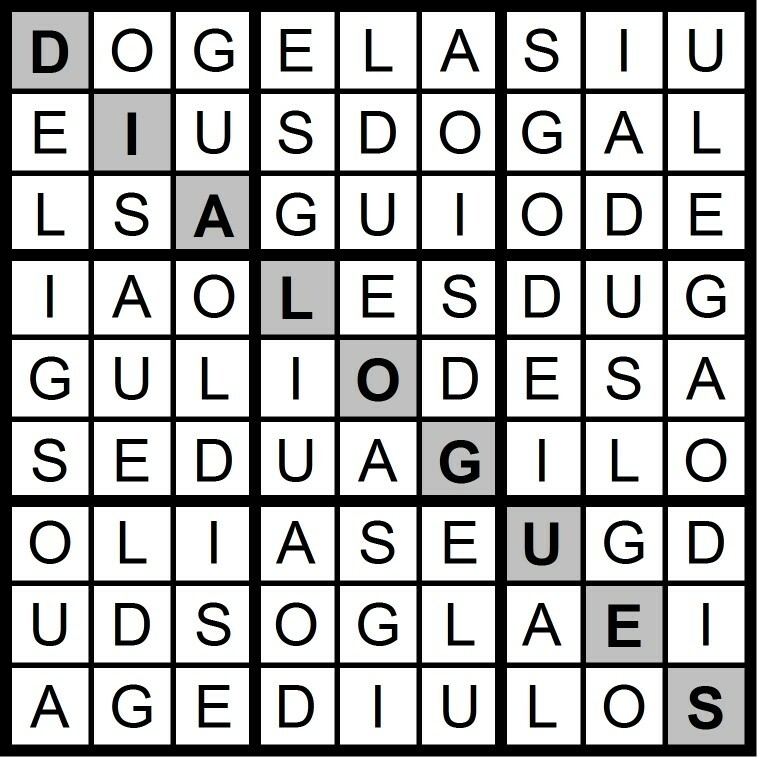 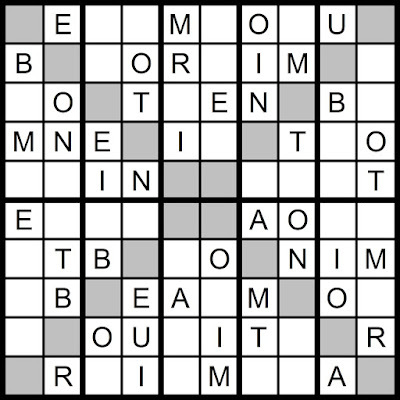 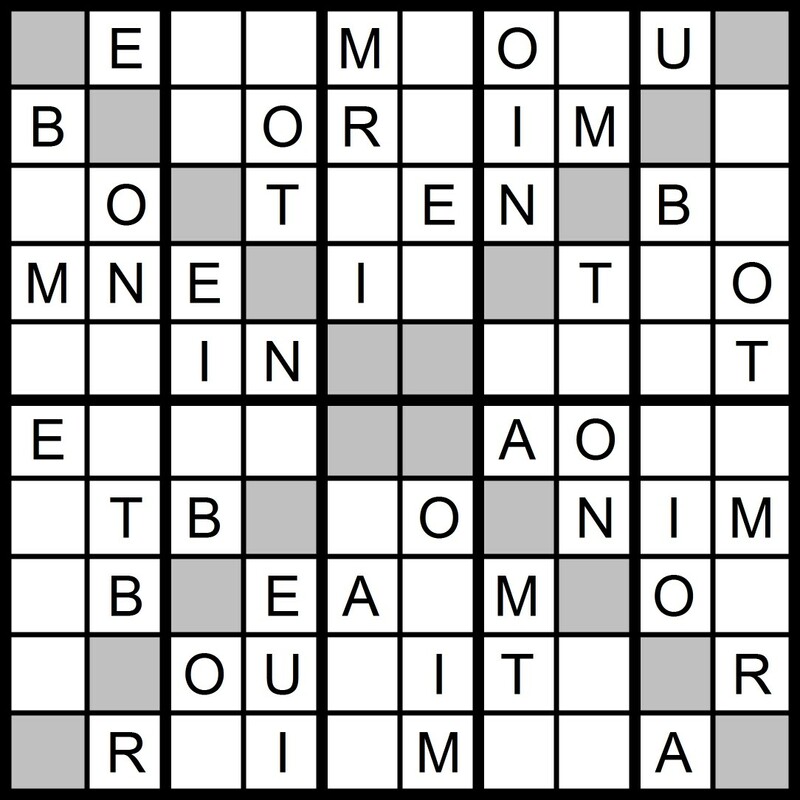 Today's 10x10 AEIOU Diagonal/Hidden Word Sudoku puzzle contains the letters AEIOU +BMNRT. 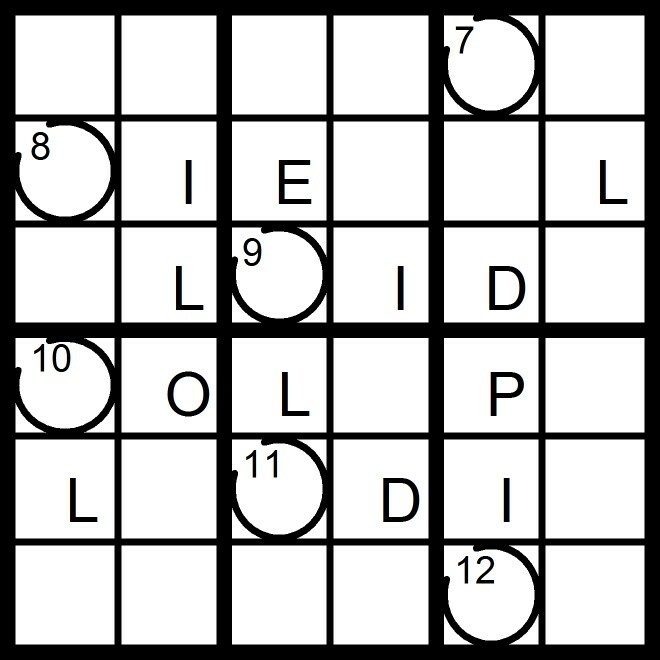 Yesterday's 9x9 AEIOU Word Sudoku puzzle was based on the word UNOPIATED. 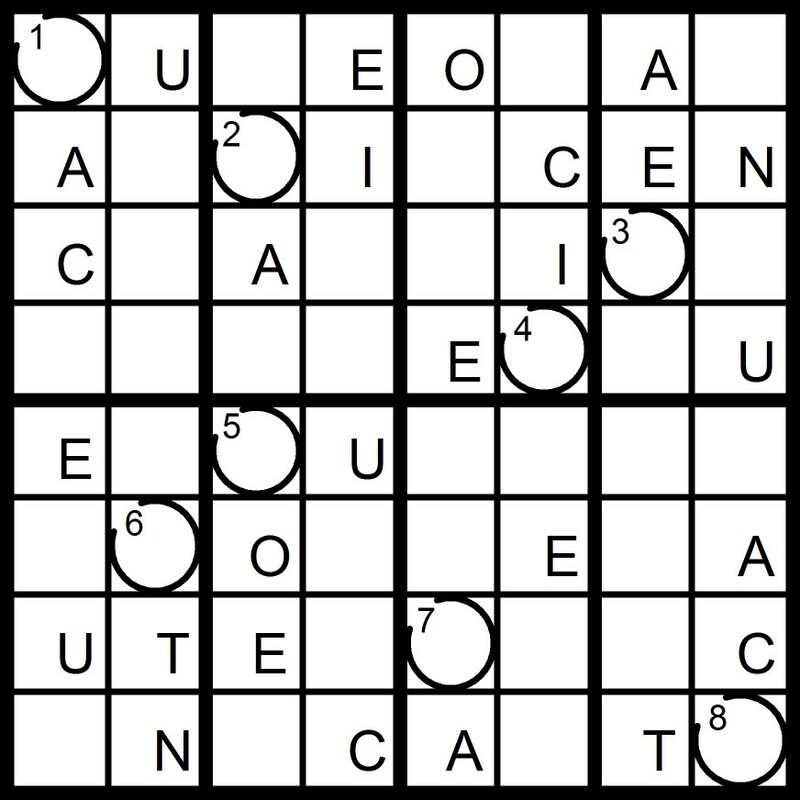 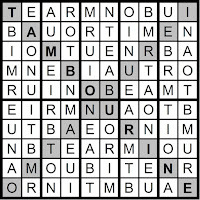 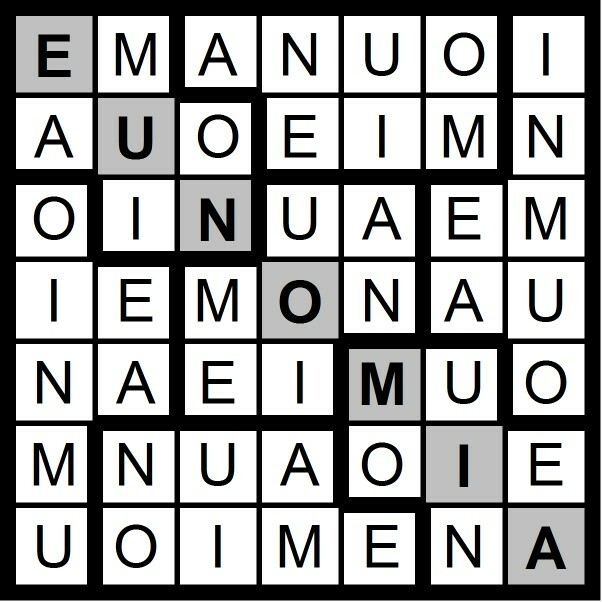 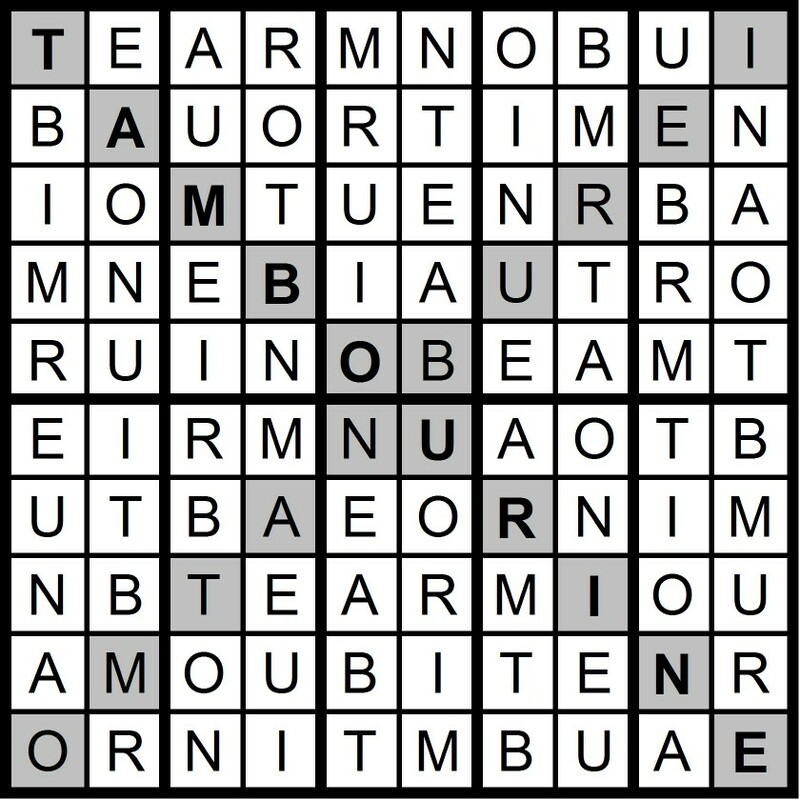 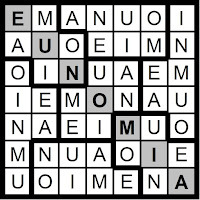 Yesterday's 7x7 Hidden Word Sudoku puzzle was based on the letters AEIOU +MN (EUNOMIA). 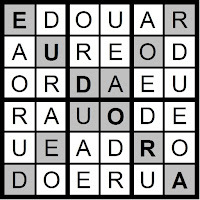 Today's 7x7 Hidden Word Sudoku puzzle contains the letters AEIOU +MN.